Even as Uncle Sam stepped up efforts to get Americans to consume less salt, sugar interests are finding ways to try to stay one step ahead of health officials’ work to make processed foods both less salty and less sugary. 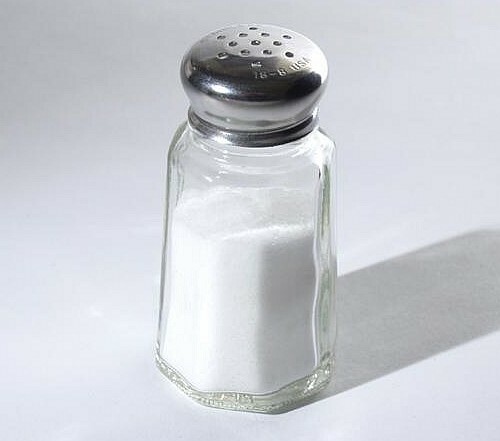 The federal Food and Drug Administration surprised no one with its announcement, after years of controversy, that it will issue its first voluntary salt guidelines, calling on food makers to slash the amount of salt sneaked into most Americans’ diets. The agency said most of us consume almost double the recommended 2,300 milligrams per day salt intake, largely because food makers pour sodium into processed foods with such a heavy hand. Many Americans, even if they try to curb their sodium consumption, may not realize just how much salt is dumped into commercially created pizza, sandwiches, deli meats, pasta dishes, snacks, breads and rolls. The FDA hopes to jaw eaters, food makers, and restaurants to go lighter on the salt. That won’t be easy, the agency concedes, because salt plays a huge role in making foods taste better; many of us don’t realize that we fancy so many restaurants’ meals, partly because chefs will use a lot more salt than any home cook would. As I’ve written, there’s also more doubt rising about the health benefits for broad curbs on salt consumption. Studies show that excess salt intake can contribute to heart and circulatory system problems and stroke, especially as it appears to fuel high blood pressure or hypertension. It may be that those with hypertension would benefit most from significant salt reduction, while the rest of us, particularly as we age, need to be mindful about lessening our sodium consumption without going overboard about it and without a lot of nagging on the topic. Moderation matters in healthy eating, as I have written. But as a skeptic, I always wonder if it makes some sense to do just the opposite of what powerful industry interests advocate−so if the food industry is pushing not only salt but especially sugar, maybe we should all run in the other direction? I’ve written before about the major health harms that excess sugar intake, especially in the form of sweets and sodas, can cause for us all, and especially for kids. It’s also alarming how Americans’ sugar intake has spiked a national epidemic of diabetes. So it’s disturbing to learn through excellent reporting by the Associated Press about candy makers’ surreptitious efforts to sway public opinion by funding so-called scientific research at reputable colleges and universities. The AP pored through thousands of emails to see how a thinly researched study at Louisiana State University, appearing to show that kids who ate more candy were thinner than those who didn’t, became fodder for huge candy industry marketing hype. The news service says nutrition researchers may be tempted by significant financial support from candy makers and other elements of Big Sugar to undertake suspect studies or to host events, giving the industry academic credibility and opportunities for hype. This kind of dodgy work had unhappy results for researchers at the University of Maryland, who ended up looking like health information twerps over a silly study wildly suggesting concussion benefits from young athletes drinking a brand of chocolate milk. I’ve pointed out that Big Tobacco and the NFL both have funded smokescreens through academic-based studies. Will pediatricians and kids fall for fizzy swag? Meantime, a Canadian doctor blogger points out some troubling health developments shared by Andy Bellatti, a dietitian colleague from Las Vegas who is an Argentine native. Posted photos show that Coke has a marketing campaign under way with pediatricians in Argentina. It features office swag, including branded prescription pads and branded “diplomas” for good-behaving kid patients. The blog suggests this outreach also is occurring in Chile. And it may have the official blessing of pediatrician groups in Latin America. The point of these initiatives – which barely make a dent in Coca-Cola’s operating budget – is to align the brand with health authorities in order to gain public trust. A sports figure hawking soda in a television commercial sells “cool”, but a pediatrician advertising soda via a “good behavior” diploma or a prescription pad is supposed to provide peace of mind to parents. The best move health professionals – including, but not limited to, doctors, nurses, and dietitians – can make is encourage all patients, regardless of age, to limit or avoid sugar-sweetened beverages. Coke, though it got caught with its hand in the cookie jar over another effort to fund research and to partner with medical groups, appears to be moving sneaky marketing tactics from the fringe to the mainstream, the blogger says. Hear, hear. They deserve credit and Coke a brimming cup of shame. By the way, as a patient, look around at your own docs’ office during the next visit and see what swag’s there. Happy about it?